I wanted the falls to look nice. There's hasn't been a lot of reason before to show Selkie's feet in detail, so this marks the first usage of the partial ball-joints on her toes that allow her to fan out the webs. I like seeing her happy! Oh, and the shoe in panel 6? She probably hasn’t swum for quite a while, and I think it only just hit her how long it had been. Wonder how long before Todd starts freaking out? Selkie has gills. She can breathe under water. Logically she will not surface for a while. Todd is a new father. No matter what your BRAIN knows, if you child dives in the water, for the first time in your presence, and doesn’t come up for ten minutes, your HEART has to be screaming, “Oh my God, she drowned”. Even if he doesn’t freak, the other two should. Aside from the dinner party, this is the first time they’ve been around her, right? Probably have heard “breathes water” but don’t really believe it. It seems like pretty clear water though. I don’t think she’ll get out of sight that fast. The comic strip today is so good. The picture of the water falls is outstanding. 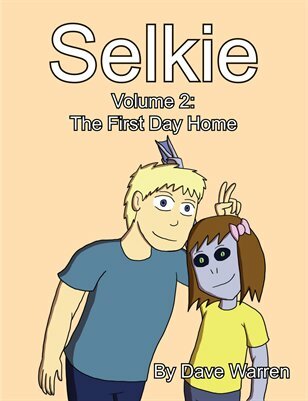 I enjoy keeping up on the life of Selkie and her family. It’s to protect against spam. It’s nothing against you, but he has to check before the comment is posted to make sure it’s not filled with cursing or just pointlessly unrelated. There used to be a massive spambot issue, so rather than risk that again, the comments (with possible exception those with Gravatars – I don’t have one, so I’m not 100% sure) get screened before showing up for the others. This actually reminded me I’ve been meaning to look at my moderation settings to see why some people are held and some aren’t. Never considered the Gravatar angle, not sure how to fix that, but for now I removed a few of the keywords which signaled a comment to be held in moderation, so hopefully less real people will be held over. For me I think it’s because my email address is a Yahoo one, and a lot of spambots use those. Also wonder if the closed sides of her shirt will have any impact on her ability to breathe. I doubt it. Most t-shirts aren’t made of material that restricts airflow, seems unlikely they’d do anything against water flow. If you have ever tried to breath through a wet cotton shirt I would call it difficult. The only thing that would make it easier for her would be the fact the water would be shooting out instead of trying to pull it in. The “Yes Very Much” was what hit me. This is my favourite strip. There’s so much to love about it. The great detail of the waterfall, and Selkie, Selkie, Selkie, with the crazy eyes, the scream of pure abandon and her absolute joy in the water. Yup, love this one. I’m not sure about the splash. It seems to me that Selkie might well know exactly how to get into the water swiftly and with a minimum of noise and water turbulence. In her species dinner could well be dependent on not alerting everything in the water that she was coming. I am also guessing that she might have natural “polarized” lenses in her eyes the better to see into the water from above. When I got uber-polarized sunglasses I was amazed at all the fish watching I could do from the bank. Wait…. that giant blue-eyed eyeball that appeared on the beach in South Florida… Could it be that one of Selkie’s family was interrupted just before dinner? Am I the only one who kinda wants that last panel as a t-shirt with fishies swim written somewhere on it? So much love for this comic. …I gotta say, if they’re standing on the bank there, and not up one a cliff(which I initially presumed) then that doesn’t look like it would be all the deep. Or have much iin the way of fish. Love the eyes and backgrounds for the Selkie only panals. They’re very Loony Toon-ish and I love that. And yeah, if that’s her half submerged in panal 6, there really should be a splash. They’re not far from the foot of a waterfall, so it doesn’t seem unreasonable that there would be a deep pool there. Any heart-wrench left over from the recent strips/arc is now vanished all at once with Selkie’s love of the water… Absolutely awesome. Its not an impediment, think of it as the sound she’d make while breathing from her gills. I always assumed that all the ‘s’s were because she has pointy teeth. Plus pool water is often treated with chemicals which I doubt would be healthy for her gills. She already complained about tap water. Well, technically any chlorinated pool has poison air in it, since chlorine gas is highly poisonous even to humans (inhaling causes chemical burns in your lungs), and additionally, as it reacts with biological particles, it creates chlorinated carbon compounds, which are universally bad news to inhale. In swimming pools this is made worse by the fact that these compounds, although very volatile, are heavier than air, and thus tend to stay close to the water surface, exactly where a swimmer will breathe them in. Wow, the art on this page is just beautiful. I love the last panel with her in the water, absolutely gorgeous. LOL panels 2 and 4. This might very well be the perfect place for Selkie to go swimming. The water is clear, fresh and, because of the waterfall, well oxygenated. I only worry about the temperature. We know she doesn’t do well in the cold. Trained divers don’t make splashes. My mother, who is human, can dive into water from 15 feet and hardly make a ripple. Selkie is a water creature, I’m sure she’d say splashing is for babies! Actually, the possibility of parasites in her natural food might be the reason her saliva is poisonous. Evolved natural protection. But unless she chews her food, the parasites inside the fish might not get affected. And her teeth don’t look like made for chewing. True but what if the poison is more from biting upon catching? Using her hands to speed through the water, she could use her mouth to chomp onto the fish and use the poison to either kill it or cleanse it or even both. If the parsites in the bluegill do not harm the bigmouth bass that eats it, why should they harm her? She’s not human. My understanding is that it is quite safe for a person to eat raw fish that has worms in it but quite dangerous for a person to eat raw mammal meat that has worms in it. Perhaps fish bacteria holds less risk for people than mammal bacteria? But of course Selkie would be more vulnerable to aquatic parasites and bacteria than Todd would… assuming Selkie is terrestrial. But as long as the parasites remain inside the fish they’re not trying to infect Selkie. Poisonous saliva could work by either killing those that try to leave the fish she’s eating OR by keeping them from leaving the fish until it gets to her digestive tract where her stomach acids would deal with them. Yeah! That makes a lot of sense! The acidic saliva in her mouth and throat would protect her, and perhaps her stomach and digestive juices are super acidic as well. Aww, I’m happy for her. Poor girl probably hasn’t gotten to swim in who knows how long. I doubt she can handle chlorinated pools. The trees look lovely!! Eeeeee!! She’s in her natural habitat now. We will never see her again. This really was a great comic.